I dare you to find an unpointed toe or a bent leg amongst these sparkling juniors. In this group, great form and beautiful performances are the rule and not the exception. Watching this meet felt like watching a senior meet, except with floor routine after floor routine that were delightfully performed. Below are the results and a video of the top scoring routine from the two nights. And at the bottom are our new Junior National Team members! All photos and videos are from USA Gymnastics (Photos by John Cheng and Geoff Bolte). The top scoring vault was a delightful vault by Ariana on day 2. She scored a 9.6 execution score (15.4) with a vault that was most definitely one of the highlights of the entire competition. The top scoring bar routine of either night was Veronica Hults, who scored a 14.65 on day 2. The top scoring beam routine was Bailie Key’s routine on day 2, scoring a whopping 15.5. Bailie Key scored a 14.8 on day 1 and Laurie Hernandez scored the same on day 2. So here are both delightful routines. 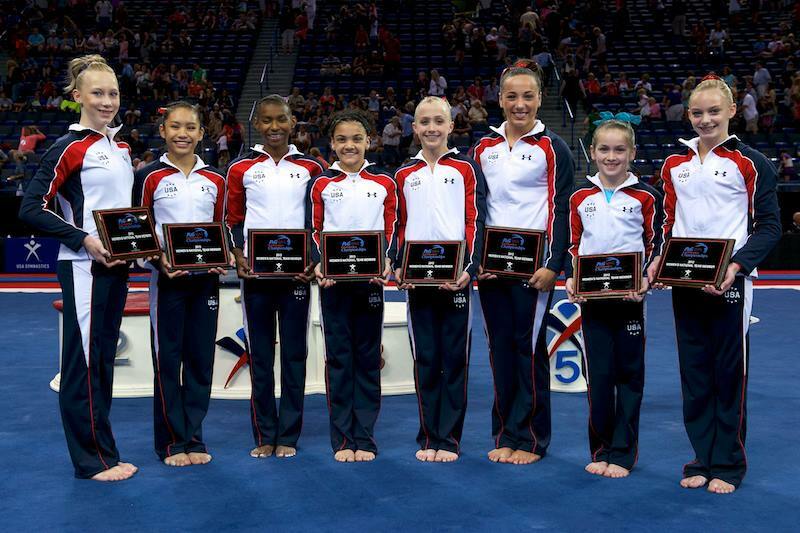 The top eight all-arounders were named to the Junior National team. It is not uncommon for Marta to add more.